I have this thing about scents and holidays, it all started with my honeymoon a few years ago, I took a new fragrance with me and wore it everyday while we where away. I haven't worn it much since then, just a few days here and there but every time I do it takes me right back to that trip. Even my hubby notices and chirps in with a 'oh that's the honeymoon perfume' and we end up chatting about the trip for a while. The human brain works in mysterious ways! Ever since then I've been obsessed with the idea of scent association and love the process of choosing which one I'll take away with me on holiday. To the point where I have a couple stashed away unopened because I know I want to take them to some exotic location which I haven't even planned or booked yet! 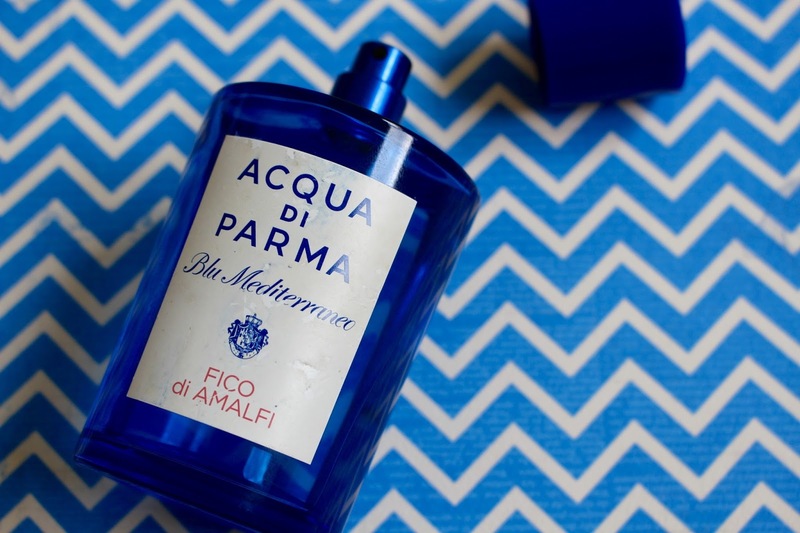 My last trip to the Amalfi coast was no exception, I had a bottle of Acqua di Parma's Fico di Amalfi from their Blu Mediterranean range and it would have been rude not to take it with me. It had been sitting in my drawer waiting for this very moment after all. It's such a gorgeous scent that I fell completely head over heels with, in my opinion it's the ultimate summer fragrance. Think Diptyque Philosykos but a bit less green and a bit fruitier. Anyway, moving on! You probably want to know what it smells like. Described as a 'woody green' the main note is obviously fig, as the name would suggest. It combines fig nectar in the heart note with fig wood in the base note which balances it out beautifully and is what I think really makes this scent. It's not floral or woody but the hint of both combined with all the citrus top notes (bergamot, lemon and grapefruit) just blend beautifully. It also has pink pepper, jasmine petals, cedar wood and benzoin making it an even more complex scent that somehow manages to be summery, light, fresh and fruity while still being very sophisticated and grown up. I sprayed it liberally and chucked it into my beach bag, the bottle ended up covered in sandy sea water and now looks a little bit worse for wear but it was so worth it. Now every time I smell it I know I'll be transported back to that anniversary trip we took to Italy, where we relaxed, enjoyed each other's company and our little baby was growing away in my belly. Acqua di Parma Fico di Amalfi Eau de Toilette is £63 for 75ml/£90 for 150ml from Space Nk or $102 for 2.5 oz/$152 for 5 oz from Sephora.